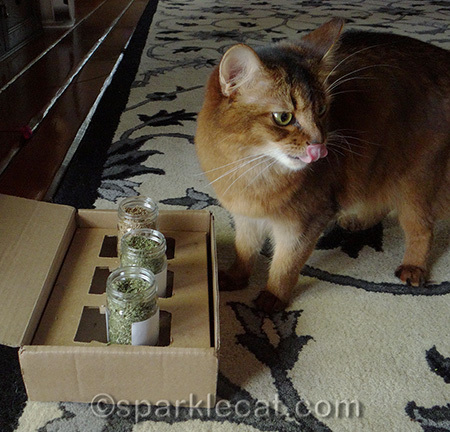 When I was at the Meow Meet during last month’s CatCon, I ran into somebody with a brand new company that sells fine herbs for cats. She offered to send me some samples… as if I would ever say no to that! So a few days ago, this lovely box arrived from Tabby James! 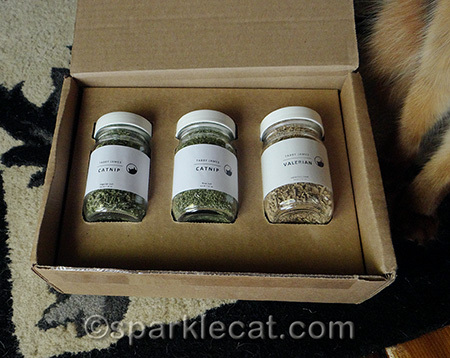 It’s a three-pack: regular cut catnip, fine cut catnip, and valerian root. This isn’t just any old herb, though — they all come from certified organic farms and are 100% chemical free! Each glass jar is sealed airtight so they arrive fresh and potent. And the presentation is both minimal and elegant — perfect for gift-giving. I decided to give each jar my own discerning sniff test. The regular cut nip was highly fragrant and sweetly intoxicating. The fine cut nip is just as intense, with less mess. I thought you humans would like that last part. I was already a little high from the regular cut, so I may have been a little dizzy when I tried this jar. And the valerian! Wow. I’m surprised I didn’t pass out from pleasure. After trying out all three, I attempted to pick my favorite. It was difficult. 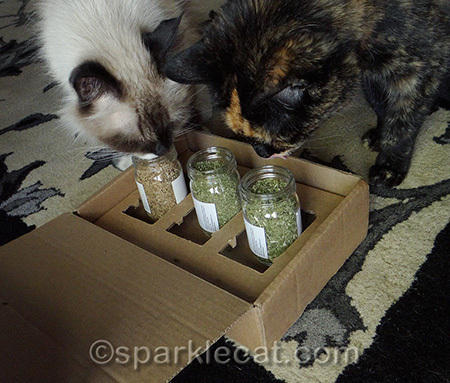 So I called on my assistant herb testers. They too were impressed by the high quality and intense fragrance. In fact, somekitty was so impressed that she decided not to let the other kitty have anymore! Thank you to the Tabby James human for these! We really love them and we highly recommend your fine herbs! 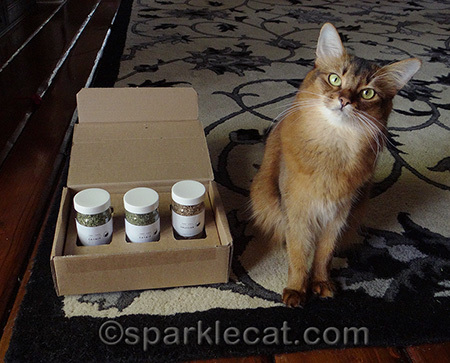 Disclosure: We were provided with this boxed set of intoxicating cat herbs by Tabby James for our honest opinion. I wasn’t actually asked for a blog post… but I wanted to share this cool product with my readers! OMC!! A nip fest and feast!! Wow! You sure got the good stuff, Summer! Did Binga and Boodie let you have at it,too?? We sure hope so. That’s so classy, love it! So glad all three of you Ladycats enjoyed the stuff…cool! My cats haven’t really reacted to catnip in the past. But I haven’t ever tried really high quality. These look worth a try! Wow! I’ll bet Toby would love that nip!!! Wow, a boxed gift set! Fabulous. I am surprising you were still standing by the time you finsihed sniffing the Valerian Root. Did it smell like stinky feet? oh, we love the presentation of the nip and valerian in the jars! 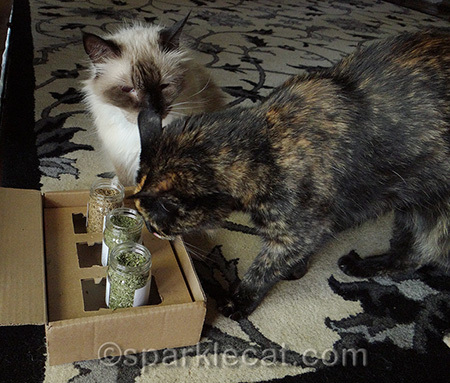 you sure get some tough jobs to do, Summer 😉 You and even Binga and Boodie look very serious in your testing 🙂 we like to eat nip leaves so our mom wants to make sure she is getting us safe stuff. We’ll have to check this out. Thanks for letting us know about Tabby James, Summer! I would have picked the valerian paws down. I think your eyes might actually have been watering at the aroma. I thought one of the jars would have been silvervine. I think they get their stuff locally sourced, and I don’t know if there is any silvervine at all that comes from the U.S.
That must be good for even Boodie to join you. I love the packaging. Great post. Wow, dat looks like some good stuff. What a cool box of herbs. You’re right, this will be perfect for gift-giving! Hrm, looks like a job for a Connoisseur! We’ll just not mention this in front of the boys, shall we? What a lovely assortment! Those would definitely make nice gifts. What a wonderful box to receive! 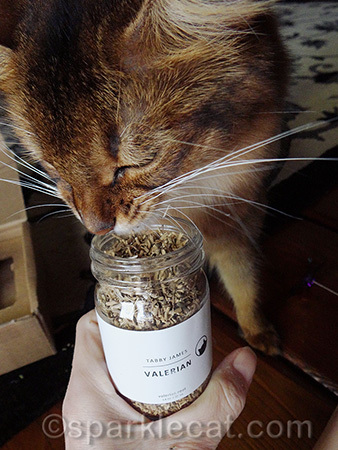 I like valerian the best, but my mum says it stinks. Summer, the catnip gives you the same “look”, the kiwi tree sap gives to me. I really would like to taste your catnip, but my human thinks that I am allergic to it. It’s true that I had a bad allergy after playing with a catnip ball. But I’m sure it has something to do with the product used to make the ball. That looks elegant and FANTASTIC! Those look terrific and sure would make a great present. The three of you sure gave it all a good test. We are going to get the Mom to check it out a little more. Thanks for the info. We are getting a bit dizzy just from reading about these herbs! Man… they sure look good!!! Whoa! That stuff sounds pawesome! 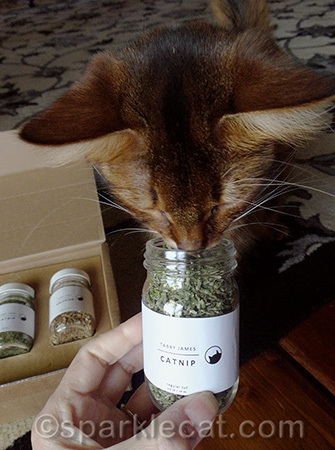 We didn’t know there was gourmet nip but now we do! Glad you let Binga and Boodie sniff some too! 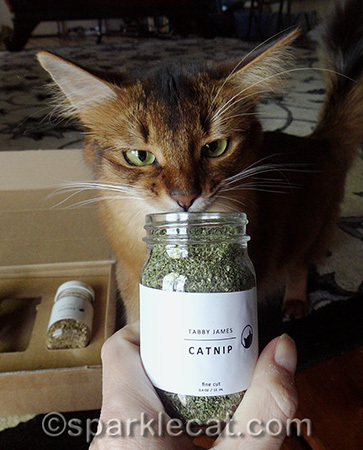 Ohhhhh fine catnip should be savored much like fine cheese or wine. Now that’s a truly FUN kind of “taste-testing” isn’t it Summer????? thanks for sharing Summer! I LOVE how they are packaged! 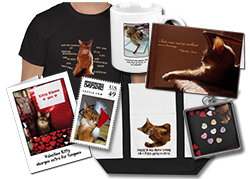 Wow, that would make a pawsome gift! You kittehz will have many good times trying out all that stuff. Thanks for the review, Summer. We loved it! That is some darn good whiffin’ and we might have to give it a go! wow you have a classy supplier. Awesome! We will have to check that out! Looks like everyone had fun with this blog post! We are glad that Boodie joined in on the fun! We are glad that you all like the herbs so much. We can almost smell them too! Oh my goodness! How fantastic a gift! Boodie, I hope you went back and shoved somekitty away? Gotta love good nip! We are very picky about what kind of nip we put in our fundraiser toys! We might have to give these ones a sniff. Oh my Ceiling Cat, that looks like NIRVANA in bottles. 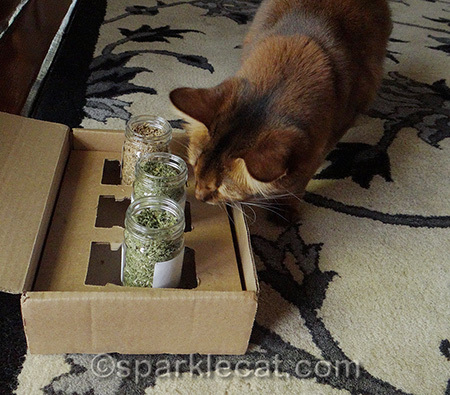 Wow cat nip and valerian – we hope you won’t get the sillies like we do! 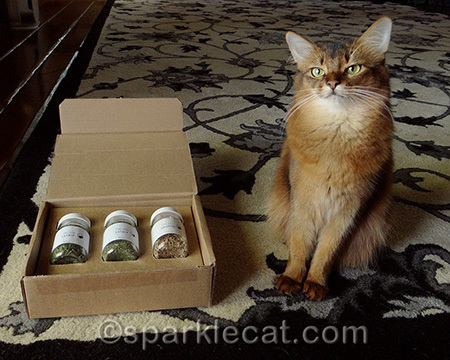 That looks looks like a tasty trio of goodies for any cat!